A minute ceremony was held to mark the event attended by teachers and officials from SIFF. The government was represented by the Director of Primary Education from the Ministry of Education and Human Resource Development, Benedict Esibaea. Third Secretary to the Australian High Commission, William Ewing, was the guest of honour at the event. 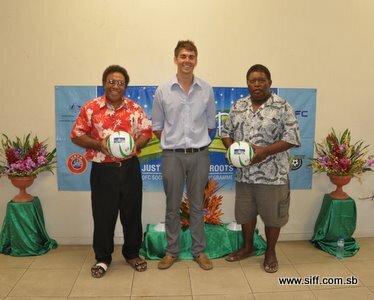 The official declaration was made by Ewing after a brief speech in which he commended the SIFF Just Play team for making the program a success in Solomon Islands. SIFF President thanked the Australian government for their support for the Just Play program saying that the 5000 children in the program throughout Solomon Islands are surely benefitting. “I wish to register my sincere appreciation to the Australian government for funding this important grassroots program,” Alufurai says. Alufurai also called on the teachers to use Just Play as a tool to encourage young children to engage in sports at school and in their homes. “Nowadays children are exposed to activities which are affecting their health in the long run. Television and video games are keeping children indoors for hours on end and I ask you to empower Just Play to take the kids out onto the playing grounds throughout Solomon Islands,” Alufurai says. Esibaea used his speech to highlight the importance of physical education in schools and the efforts his office is making to take the Just Play approach into the formal education system. “In the past physical education was a main component of going to school but nowadays things are different. However, with the success we have seen with Just Play efforts are being made to re-strengthen physical education in schools,” Esibaea says. After the opening ceremony the training workshop started for the 6 schools and 1 community that are attending the first segment. Christopher Asipara, who is a trained Just Play instructor, is leading the sessions with the teachers. The sessions for the first group of schools will end tomorrow and certificates will be issued to the participants. The second and third groups will commence their training on Wednesday and Friday respectively. After the completion of the Honiara launch the Just Play team will be heading to Marovo extend on work carried out there in 2010. The Just Play program was commenced in Solomon Islands in May 2010 and from then it has grown to become a major grassroots football development program attracting widespread support and interest. Currently, there are 82 schools and 3 communities participating in the program involving more than 121 Just Play trainers and 5000 children. The Just Play philosophy integrates football training with community awareness and education on social and health issues. It is supported by the Australian Government through the Australian Sports Commission.